The last man to be sentenced in connection with the sectarian murder of Catholic schoolboy Michael McIlveen will serve a minimum of eight years of his life sentence for the "secondary" role he played in the fatal attack. 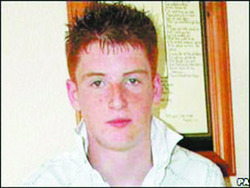 Michael McIlveen, 15, who was murdered in Ballymena seven years ago. Michael 'Mickey Bo' McIlveen died in hospital after he was chased and attacked by a group of drunk Protestant youths in Ballymena on May 6, 2006. Jeff Colin Lewis from Rossdale in Ballymena - who was part of the group of attackers - was handed a minimum eight-year tariff sentence on Tuesday. Belfast Crown Court heard the 15-year old victim was chased down an alleyway where he became embroiled in a fight with Lewis, who is now 24 but who was 17 at the time of the murder. The court heard Michael McIlveen "was bettering" Lewis, when he was approached by other members of the Protestant gang, one of whom hit him on the head with a baseball bat that had been picked up from a nearby home. The blow felled Michael and while he was on the ground, he was attacked and kicked by a number of people, including Lewis. The head injuries sustained from being struck with the baseball bat proved fatal. During the tariff hearing, Crown prosecutor Liam McCollum QC said the events which led to Michael's death began at the Seven Tower Leisure Centre. Michael and his friends fled from the drunken group but were pursued to the alleyway at Granville Drive. Mr McCollum said it was accepted that Lewis played a "secondary role in the murder of Michael McIlveen." Defence barrister Richard Weir QC told the court that while there was a sectarian element to the attack, it also involved "immature drunken youths behaving badly." Saying his client "played a peculiar but particular part in this murder", Mr Weir said Lewis was not aware of the presence of a baseball bat until Michael was attacked with it, and instead of removing himself from the scene, Lewis made the "dire error" of kicking the teenager as he lay on the ground. Mr Weir also revealed his client had expressed genuine remorse for this role in Michael's death, and had suffered a "complete mental breakdown" whilst in prison. Branding the incident as "tragic", Mr Justice Weatherup said Michael McIlveen died as the result of a sectarian attack. He told Lewis that as Michael lay prone on the ground after being struck by the baseball bat, the injured teenager was "kicked by other members of the group who were present and you were a member of that group". Lewis is the fourth man to be sentenced for the murder of Michael McIlveen. Mervyn Wilson Moon, 25, from Douglas Terrace in Ballymena, is currently serving a minimum ten-year tariff after he pleaded guilty to his role. It was Moon who administered the fatal blow to the victim after striking him with the baseball bat. Christopher Francis Kerr, 26, from Carnduff Drive in the Co Antrim town - who lifted the baseball bat from a house close to where Michael was attacked - was given a minimum nine-year tariff, while Aaron Cavana Wallace, 25, from Moat Road in Ballymena, is serving a minimum eight-year tariff. This page was loaded Apr 25th 2019, 9:41 pm GMT.